I NEED TO...migrate my devices to Android. Map your existing telnet functionality to Velocity and the Android experience. Connect to existing enterprise systems from Android devices, easily. Check out how your existing mobile browser maps your web applications to Velocity. Whether your existing mobile access to enterprise systems is telnet or web apps, Velocity has you covered. Your MDM needs to keep your mobile deployments secure, available, and accessible. That’s Avalanche. Avalanche keeps your workers connected, effective, and at peak productivity. 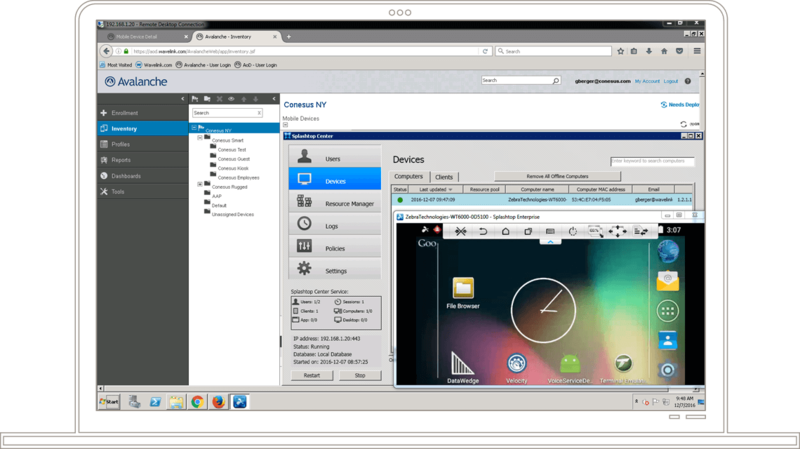 Check out how we’ve built on our Windows Mobile/CE capabilities to manage your Android mobile deployments. What stage are you at in your Android Migration? More than half of warehousing professionals surveyed are planning their mobility upgrade because current devices are aging and nearing end of life. Ivanti helps you extract more value through your migration. Advanced scripting awesomeness lets you optimize workflows. Parse barcoded data into fields, highlight important info, customize tones for alerts, errors, etc. Velocity, powered by Wavelink, is the path to bring existing browser applications to touchscreen devices and the Android operating system. Bring your Industrial Browser or CETerm apps forward to your new mobile-device deployments. Don't let browsers cause security concerns. Keep workers out of browser controls and focused on the task at hand each day. Be more productive. That's the key. Modernization is easy using Velocity. There's no need for middleware between your mobile devices and your host. Implementation is simple and fast. Wearables, handheld devices, or tablets, you have Android options. Deploy the optimal device and let us worry about the rest. Update the "green screen" and take full advantage of all that Android offers: touchscreen, intuitive navigation, and a smartphone-like experience. Your workforce expects it. Voice can help. Customers who voice-enable with Speakeasy powered by Wavelink are saving more than $500,000 per year. How much can you save? Get started now. How do you bring the mobile web interface forward to leverage touchscreen experiences your employees expect on Android? The answer is the Velocity Browser, powered by Wavelink. Terminal emulation and web applications have a long and proven history. You’ve invested in these systems, and want to be sure you can leverage them, even as you explore a new, expanding generation of mobile device hardware—including Android-based options—for your workforce. The challenge is, you’ve been running WinCE or Windows Mobile for a device generation or two. We have the answers. These are the products you need in order to modernize and migrate to Android. Migrating to Android shouldn't keep you up at night. It's a no-brainer thanks to the new features you'll have access to. The Velocity platform consists of the mobile app/browser and administrative console. There’s no need for complexity to come between your mobile devices and your host application. We literally built the Velocity platform so you can avoid the pain, cost, and risk of Android migration. If you considered migrating but didn't know how to tackle it, now is the time. What about the systems you've already invested in and optimized? Choosing an Android device and modernizing your telnet or web application with Velocity—even adding voice—means you can make the leap to Android without having to touch your host apps. Your existing and trusted 'green screen' client becomes an Android app—complete with screen-tapping navigation, a clean and intuitive UX, and full-color graphics. You'll need to send your employees home because they'll want to keep using it! Adding Speakeasy to voice-enable your apps is as simple on Android as it's proven to be on existing systems. Create custom keyboards that offer only those keys relevant to a particular stage of the workflow. Then, add branding elements and color schemes to make your apps your own.